To access your NMC Self-Service portal, click on myNMC at the top of any nmc.edu web page (including this one). If you’re using a computer on campus, you’ll be sent to your NMC Student page. If you’re off campus, log in using your NMC ID and NMC Password. Use the Forgot your NMC ID? and Forgot your password? links if you’re not sure about your ID and/or password. You can also call the Technology Help Desk at (231) 995-3020 to get help logging in. 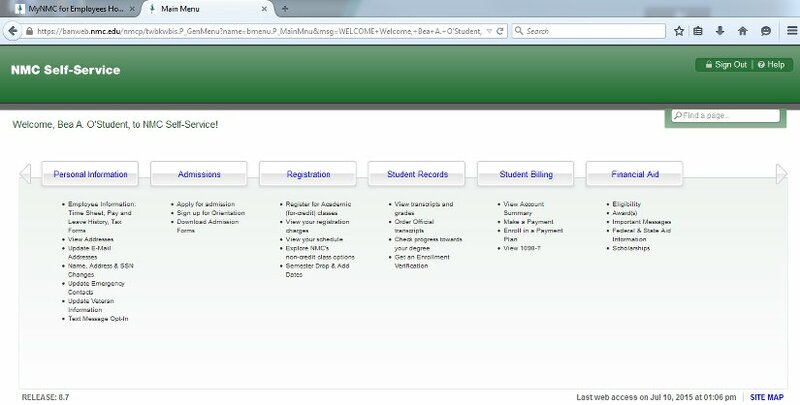 Click on "Self-Service" Student Portal to access Self-Service. Your Self-Service Screen has a number of categories. Descriptions for the categories are listed under the buttons.